When is the last time you chose a restaurant because you liked their logo? Or the last time you were drawn to an eatery because their napkins matched their colour scheme? The likelihood is that this has never happened. This isn’t to say that a properly branded restaurant is a bad thing. It is just that I have an aversion to distractions where food is involved. When a restaurateur takes every detail into consideration this does make for a better experience but I’ve come across too many instances where the importance given to all the bits that surround the food actually take away from the dining experience. I once had lunch with a couple of chefs who own restaurants that, when combined, are worth over 20 million quid. One of the chefs had just finished two restaurants in central London, spending 13 million on them. The numbers are hard to fathom when coming from a market the size of ours but let’s just say both men were quite comfortably off. While their styles and approaches are vastly different, they shared one core value – that of placing exceptional food first. You can tell by watching them eat. The book on etiquette is left outside in the drizzling rain while they stab at food with their knives, reach into each other’s plates with their hands, and in general consume food in an extremely visceral way. Watching them eat and listening to the way they speak about it is an education, a short course in placing food first and then worrying about the wrappers. At one point, someone at table mentioned a very famous restaurant and the new menu they’d launched. The huge man sitting across the table from me pulled a face. He wasn’t impressed. My first reaction is that he’d obviously dismiss stiff competition but then he gave a reason. “They won’t let me in wearing trainers and they expect me to wear a jacket. I thought restaurants were about food.” And that was the end of that. Of course, those of you who travel to visit Michelin-starred restaurants are fidgeting in your seats, formulating a retort to all this about how sometimes you want the experience, how the theatre and the pageantry of fine-dining can create something special that’s too elusive to put down in simple words. I agree with that and know that there is a place for everything. Just be sure it isn’t at the expense of proper food. The last couple of times I’ve paid for stars I walked away feeling quite underwhelmed at the contents of all 500 plates I was served (or so it felt) and I’d been on my best behaviour for nought. Speaking of behaviour, I have some recollections of being very badly behaved after dinner a few times. Specifically, these were times I was at Chukkas at the Polo Club in Marsa with a group of other badly-behaved friends. After sitting and eating fantastic steaks, we’d stay there for a drink at the bar before heading home. And one drink led to seven, which then led to more than I could count. We didn’t drive home afterwards. That would have been irresponsible. There’s something quite magical about the place. It focuses ruthlessly on meat. There is no drama about the place – they know what they are good at and they do it well and consistently. The team is efficient and they have a relatively small selection of dishes available so they know them well. Ask anyone on the service team about any steak and they’ll know how to describe it and help you with your order. For a restaurant that’s joined at the hip to a Polo Club, it is remarkably unpretentious. No one ever gasped at my costume, and if you’ve experienced my terrible lack of style you would be right to be surprised. They just took us all in, fed us, put up with our raucous behaviour and helped us stumble out. The day after one of our nights at Chukkas we all recalled the steaks, comparing notes about the texture of the sirloin and the buttery flavour of their Argentinian ribeye. If you’d asked either of us what the colour of the chairs was, we’d surely not remember. There might have been a logo on the napkin, as well, but our minds were focused on the echoes of a fun night out and the happy memories of steaks we ate, shared and compared. Recently, and by recently I mean about two weeks ago, Chukkas took over the building called Razzett l-Aħmar on the road between Attard and Ta’ Qali. Marsa was central enough and the building had heaps of personality but this takes the experience to another place. The location itself has been itching for a restaurant that will match its character and, at the risk of leaping ahead of myself, I seriously suspect it has. They haven’t done much to the place. At least not yet. So, the lighting is still a bit weird and there are bits and bobs that can be done up. But they have taken over in the way Chukkas knows how. 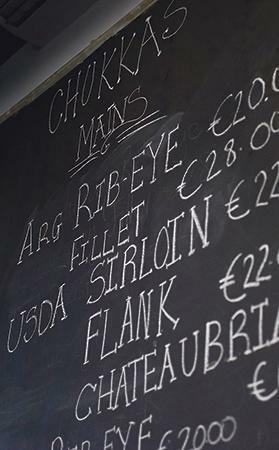 One wall, the largest available space in the inside dining area, has been dedicated to the menu, scrawled in large, friendly letters in chalk. As we’ve come to expect, there’s no faffing about. A few starters, a whole lot of meat, and a handful of desserts are all that’s on it. Chukkas focuses on steak and ribs and that’s what’s on the wall. The only menu that was handed to us was the wine menu. In true spirit of Chukkas it is unpretentious, well-priced, compact and with the variety you’d expect of a steak house. When I paid a visit, I was in rather loud company that included two little humans who are old enough to pick their own meals and, mostly, colour within the lines of their activity books. This is all taken in the stride of the front of house team. They run the place like a well-oiled machine, made all of us feel at home and braved a restaurant that was filled to capacity, all with grace and efficiency. For a restaurant that’s still finding its feet, this is pretty impressive. 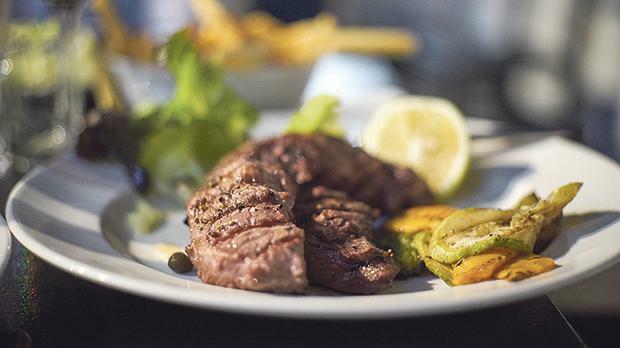 The steak selection is keenly priced, with plenty of steaks hovering around the €20 mark and served in the rather gigantic portion size that Chukkas is known for. The selection peaks at the gigantic Chateaubriand that serves two. With pork belly and beef ribs rounding off the selection as well as one chicken dish for the conscientious objector, there’s something for everyone as long as everyone eats meat. I ordered the Chukkas special starter to lead me to my USDA sirloin and the rest of the party shot their orders at the wonderful man seeing to us that night. We changed our minds, yelled across the table, changed orders again and finally settled down. Nothing we threw at our man could perturb him. He’s seen worse and kept smiling jovially throughout the ordeal. It had been a while since I’d visited Chukkas in Marsa and as soon as my starter plate landed in front of me I remembered why I’d always pick this. It presents a little of everything the place has to offer – there’s a little salad, complete with a slab of the freshest mozzarella on top, a chunk of breaded, fried brie, slices of beef carpaccio and a trio of sausage that includes a fiery spicy one that I just cannot resist. I have to admit that no matter how much I enjoyed mine, I still felt a stab of starter envy when I laid my eyes, and eventually my fork, on the parmigiana. It has to be the best I’ve sampled for a very long time. I need not dedicate too much time to the steaks. Around the table, cooking times were spot on, the flavour from an open grill gives a smoked, wooded aroma and the cuts are inevitably well proportioned. If there’s one thing that has kept the Chukkas name so popular with meat lovers for so long it is their ability to consistently deliver steak, to do it really well, and to create an informal and enjoyable context to enjoy it within. There’s time and place for everything. There’s time for dolling up and being on one’s best behaviour. There’s the right place for a first date. And there’s Chukkas, the place for when it’s time for steak and having a night out with those who matter to you. And if the people you’re with don’t really matter, just focus on the steak – you’ll walk out with a smile on your face in any case.